Progressive rock is a broad and convergent style of rock music and progressive music which arose in the late 1960s, reaching the peak of its popularity in the early 1970s, but continuing as a musical form to this day. Progressive rock is often closely identified with other styles of music such as experimental music, symphonic rock, art rock and progressive metal. 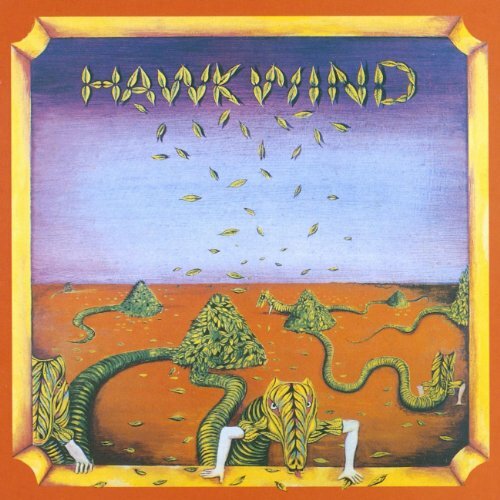 Hawkwind is a British rock music group. Formed in the summer of 1969 as Hawkwind Zoo, they were offered a record deal by Liberty Records in November of that year and immediately shortened the band name to Hawkwind. Singer/songwriter/guitarist Dave Brock has been the only consistent band member though multiple personnel changes. Their music began as hard-driving blues rock, but quickly added doses of psychedelic music, with prominent use of special effects and synthesizers. Their music usually deals with urban and science fiction themes (writer Michael Moorcock was a collaborator), and Hawkwind are widely seen as one of the earliest space rock groups. Their elaborate live performances (somewhat reminiscent of Sun Ra's) quickly gathered them a cult following, partly because they were seen as a 'community' Of the People - For the People group. Their second album In Search of Space was very successful. Hawkwind were, along with the Pink Fairies, key 'community bands' in Ladbroke Grove home of the Mountain Grill cafe. During the early 1970s Hawkwind played a number of benefit gigs along with other 'community' bands/artists including Pink Fairies and Steve Took who, as a key member of the UK Underground went on to work with a number of Hawkwind members. Hawkwind achieved chart status with the release of the single "Silver Machine" in 1972 (Written by Dave Brock and Robert Calvert, allegedly about his bicycle. Vocals by Lemmy Kilmister). Their follow up single "Urban Guerrilla" was withdrawn after increased terrorist activity by the Provisional IRA. Hawkwind have had a long-standing connection with many free festivals including the Stonehenge free festival that ran from 1973 until banned in 1985. Authorities moved in "with force" to stop the event that 13th year as, under ancient charter law, it would have become a public festival for all time. The spirit of these festivals has been reawakened by their last two "Hawkfest" weekends. Gong are a progressive rock band formed by Australian musician Daevid Allen. Their music has also been described as space rock. They were formed in 1967, after Allen - then a member of Soft Machine - was denied entry to the United Kingdom due to a visa complication. 1.Pozzo Del Pichio - Merta 2.Visitors - Visitors 3.Baris Manco - Lambaya Puf De 4.Drugi Nacin - Zuti List 5.Bran - Breuddweyd 6.Breakout - Powiedzielismy Juz Wszystko 7.San Ul Lim - Frustration 8.Egg - Fugue In D Minor 9.3 Hurel - Omur Biter Yol Bitmez 10.Illes - Nem Erdekel Amit Mondsz 11.Jean Claude Vannier - Les Gardes Volent Au SecoursDu Roi 12.Embryo - Music Of Today 13.Jazz Q - Toledo. Andy Votel of Twisted Nerve Records has wasted no time in following up the superb Folk Is A Four Letter Word compilation with another delve into a previously uncool musical genre- that most maligned of all, PROG!! But forget the over-compiled and by now mainstream works of Yes, ELP, Genesis, Tull, the Moodies and so forth. This, boys and girls, is Obscurity City. The prog here originates from some of the furthest flung corners of the continent - Poland (Breakout), Turkey (Baris Manco), Germany (Embryo), Italy (Pozzo Del Pichio), France (Jean Claude Vannier) and Wales (Bran) There's even a trip to darkest Filipino territory courtesy of San Ul Lim, stopping off for a Canterbury tale from Egg on the way. Most of these tracks have never been on CD before. Now here they are in a beautifully remastered form, and it's time for all who previously doubted to rediscover. Cherry Red. 2005.